Deep disagreements exist regarding what thinking and critical thinking are and to what extent they are teachable. Thinking is learned in some measure by all, but not everything that is learnable is also teachable in an institutional setting. 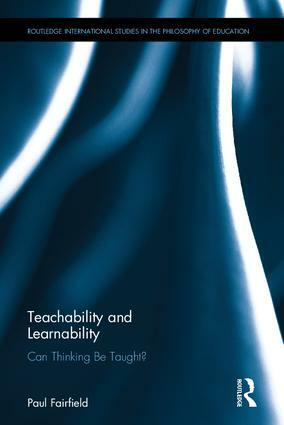 In questioning the relationship between teachability and learnability, Fairfield investigates the implications of thinking as inquiry, education as the cultivation of agency, and self-education. By challenging some of the standard conceptions of thinking, the author explores the limits of teachability and advances critiques of standardized tests, digital learning technologies, and managerialism in education. Paul Fairfield is Professor of Philosophy at Queen’s University, Canada.